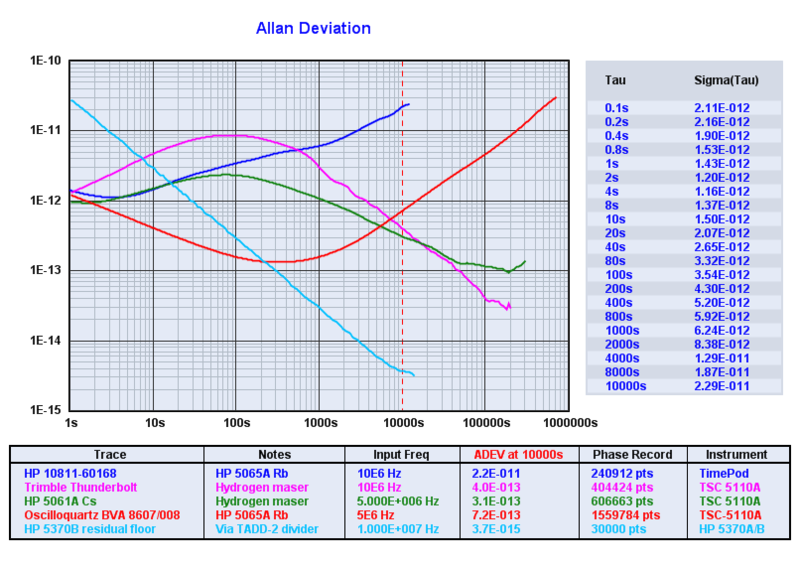 TimeLab makes precision time and frequency measurements, including Allan deviation, MDEV, TDEV, phase noise, and phase/frequency drift. The TimePod 5330A Operation and Service manual (6 MB .PDF) serves as a general-purpose guide to TimeLab. See NIST's Handbook of Frequency Stability Analysis for information on various measurements made by TimeLab, as well as W. J. Riley's comprehensive tutorial, Techniques for Frequency Stability Analysis. Moved script, mask, and example .TIM files to the %ALLUSERSPROFILE%\Documents\TimeLab directory. You may wish to use File->Reset all parameters if you have difficulty locating these files in the Masks or Scripts file dialogs. Experimental support for multichannel acquisition between two or three channel pairs. See the Stability field in the Advanced tab of the acquisition dialog for more. Added Overlapped Acquisition option to Noise and Jitter tab of acquisition dialog. Users with high-performance CPUs can enable this option for faster convergence in low-noise measurements. Firmware upgrade instructions added to preliminary user manual. Users of instruments prior to S/N 55985 should upgrade to the files above. The slope direction in the Phase Difference view now matches the sign of the frequency difference, for better compatibility with TSC 5120A and other timing analyzers. As a result, TIC users who need an accurate frequency-count chart will need to use the START channel for the DUT and the STOP channel for the reference. Added driver for Stanford Research Systems SR620 counter. Both GPIB and direct RS-232 connections are supported by this driver. Added Help->Check for updates menu option. TimeLab can be configured to check for new releases on a weekly or monthly basis, every time the program is launched, or only when manually requested. By default, TimeLab will check for updates once per week.